A Side By Side Analysis: Is Gucci Mane A Clone? This week, the latest from the never-ending conspiracy theory windmill suggests that we may have found the Loch Ness Monster near Antarctica via Google Maps and, more interestingly, that the East Atlanta Zone 6 monarch, Radric Davis, A.K.A. Gucci Mane A.K.A. Guwop, is in fact a government clone. The only thing crazier than the idea of a cloned Gucci is the sheer amount of people on the internet who believe it. The flames were further fanned when a false quote from Lil Boosie stated he believes this “new” Gucci to be a clone, citing an off vibe in the studio with Davis. The accusations caught so much steam that Gucci felt the need to address them via Snapchat, though he opted to “neither confirm or deny” being a clone. As more people legitimately began to question what happened to the “old” Gucci, Charlamagne gave out the illustrious “Donkey of the Day” to all of those who believe the rumor. He went on to publically denounce the authenticity of the supposed Lil Boosie interview, highlighting the fact that if it were to have transpired, there would be a massive amount of audio and photo evidence that would have been plastered across social media. One point that conspiracy theorists consider “proof” Gucci ain’t Gucci, is his infamous ice cream cone face tattoo, or rather the lack thereof: Fans have noticed that the tattoo appears to be gone. Not mentioned, though, is the fact that tattoos fade over time. Combined with bad lighting and the observation that neither Gucci, nor his girlfriend and Snapchat cinematographer Keisha Ka&apos;oir have made deliberate efforts to focus on the tattoo, make its alleged disappearance more convincing. But Gucci and Keisha aren’t talking about the tattoo for good reason. He’s had it since 2011. It’s old news. But hey, since we are playing in the realm of what could be, maybe he had the tattoo removed, as it surely was not his best life decision and doesn’t really seem to fit the reformed Guwop. Conspiracy theorists also believe that although he looks similar to the Gucci Mane we (almost) all know and love, the slimmed down Davis that emerged from prison after a 2 year, 8 month prison sentence does not look enough like the one that went in to be the real Gucci. As if a change in diet, lesser access to prescription cough syrup, and a whole lot of down time could not be enough cause for the transformation. Can you imagine the amount of push-ups and sit ups one could cram into 14 hours in a jail cell? Even the laziest of men could muster a few. It comes as little surprise Gucci would slim down, since he was regularly sweating it out with a trainer before his most recent incarceration. Gucci has remained dedicated to his diet, opting for a breakfast of turkey bacon, followed with fruit, veggies, and water for lunch while keeping up with his workout regime, which consists of burning calories on an elliptical and pressing out a number of poolside push-ups on his daily “Gucci Fit” Snapchat update. He’s doing plenty to maintain his newly acquired six pack, but it seems fans miss his belly. Whether they’d like to admit it or not, those who believe the Gucci clone rumors may simply be reacting to their attachment to the Gucci of yesterday. But do they really miss highway-passenger-ejecting, over-the-head-champagne-bottle-smashing, parole-violating-Guwop? If they do, then that would imply that they are looking forward to another long hiatus from Mr. Zone 6, as he would surely end up back in jail. It is hard to imagine spending years locked away from the general public and not coming out changed. 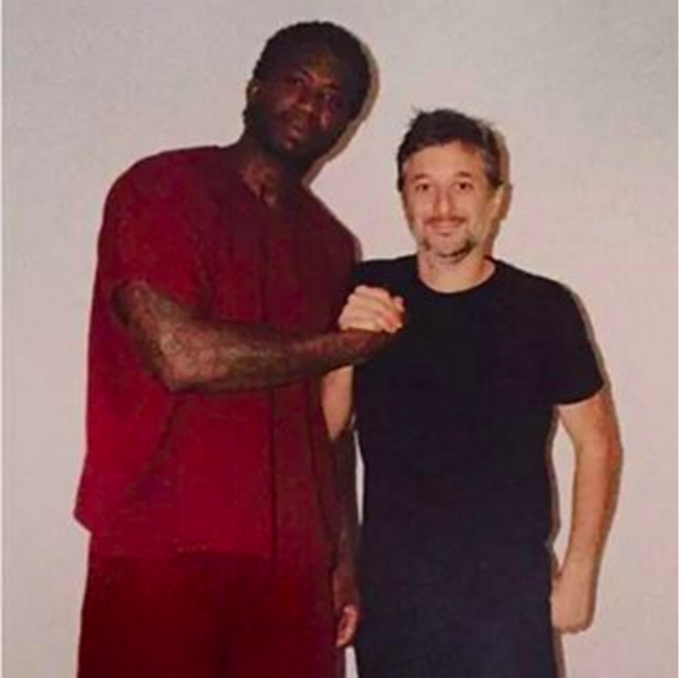 It is fair to say that time behind bars has altered Gucci’s step, but only in the right direction. He seems to be in good health and good spirits, enjoying being home with his woman and getting back to work. Let us propose a champagne toast, pinky rings gleaming, to the new, same old Sophisticated Wop.